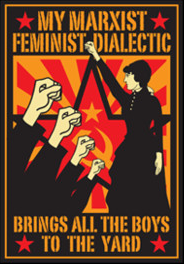 My Marxist Feminist Dialetic Brings All the Boys to the Yard. So THAT'S how Hillary Clinton got so far... (Heh heh, just kidding.). Wallpaper and background images in the U.S. Republican Party club tagged: conservative politics funny hillary clinton. This U.S. Republican Party fan art contains anime, fumetti, manga, and cartoni animati.